Wondering whether naked cakes are right for you? Cast aside all your doubts. These cakes have the perfect amount of sweetness, without being overly sweet. The “Flowers Cascade Wedding Cake” has three tiers of cake with minimal frosting, thereby highlighting the beautifully baked layers of cake underneath. The crumb coating is done artistically to create an alluring and tempting look. 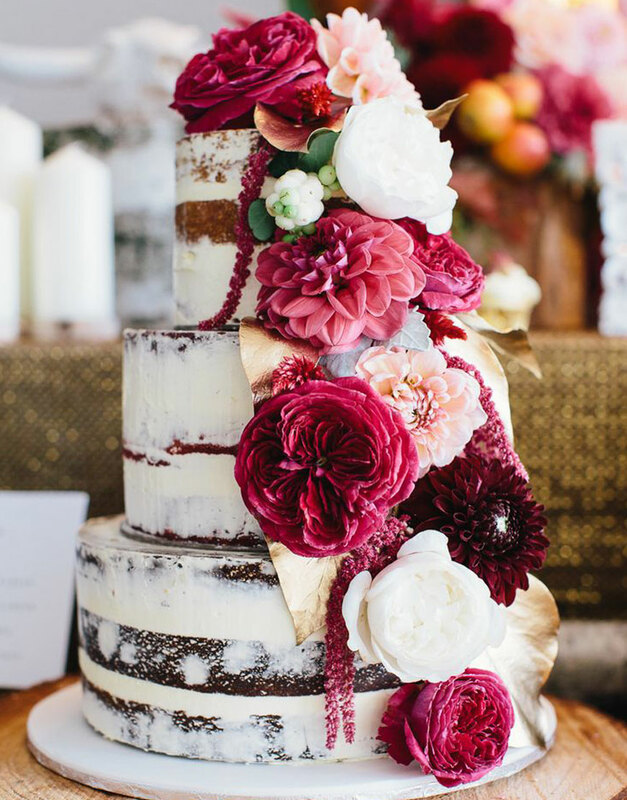 This cake looks chic and stunning. The topmost tiers are made out of vanilla, the next tier is made out of red velvet cake followed by chocolate on the third tier making this cake a combination of all great flavors. To accent the cake, a charming arrangement of fresh flowers is made from top to bottom diagonally. Crimson, burgundy, purple and white flowers are used in this sample. However, it can be customised according to your wedding themes. We will use plastic flowers when fresh flowers aren’t in season. Check out our gallery of designer wedding cakes for inspiration and get in touch with us for customization requests.